Can I screen on free float? Yes, you can screen on the free float percentage, for example, to eliminate companies that are closely held by a single shareholder or a family. Free Float shows the percentage of total Common Shares Outstanding which are “freely floated” on the stock exchange. Some shares are very tightly held by founding shareholders. As they are unlikely to be sold the number of shares outstanding is not a very clear representation of how much stock is actually available to be liquidly traded on the stock market. The Free Float is a better representation although some of the shares 'freely floated' could be held just as tightly by institutional or private shareholders as founders. How is Free Float defined? Free Float is defined as Total Shares - Treasury Stocks - Shares held by Strategic Entities). Strategic entities means that the shares are held by Government Agencies, Corporations, Holding Companies and/or individuals. This is where the shares are held with the intention of gaining market share and/or having control over the company, meaning that strategic investors do not primarily intend to earn short term gains from the shares through an increase in share price unlike, say, investment management companies. This is available here in the Ratios glossary. Any screen can be duplicated and that criterion added or it can be added to a custom screen . 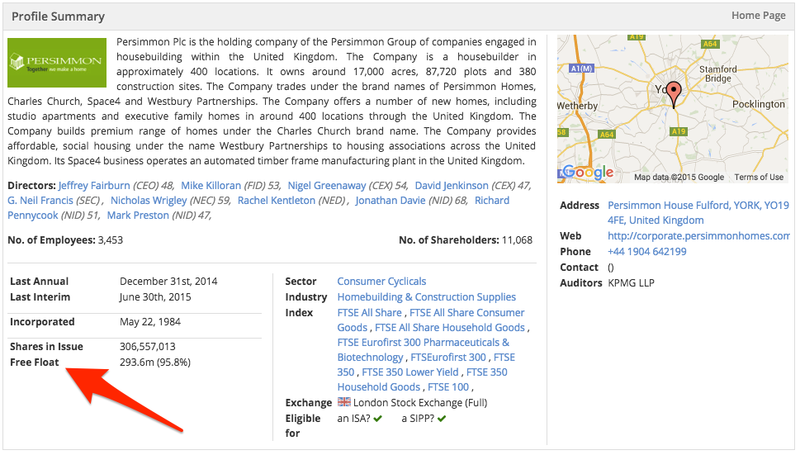 This figure is also shown on the bottom left of the Profile section of the stock report (see screenshot below).